Madrid is located approximately 350 kilometres (around 220 miles, around a 4-hour drive) from the nearest beach in the region of Valencia, but now the Madrid Urban beach is a reality! In January 2008, the Madrid Río project (el Plan Especial Madrid-Río) was unveiled by the Lord Mayor of Madrid, Alberto Ruíz Gallardón. Due to the move underground of a large section of Madrid's inner ring-road, the M-30, 820 hectares along the Manzanares River have been converted into a long park, including an urban beach, rowing lanes on the river, walks, bicycle paths, kiosks, cafés and restaurants, terraces, cultural and sports facilities, areas for pensioners and children's play areas. All this just 1.5 kilometres from the Puerta del Sol in the centre of Madrid. This large green area runs alongside Madrid's river for a total of 6 kilometres and is an average of 25 metres wide, connecting already existing green areas such as the Casa del Campo with the city centre. You can see all facilities, with maps and practical information in this Madrid Rio PDF document. Madrid's beach is located close to the existing Arganzuela park, near the old slaughterhouse (Madrid Matadero), which is been converted into a cultural centre, with exhibitions, workshops and conferences. This area allows tourists and inhabitants alike to enjoy a seaside atmosphere with areas for sunbathing. The impressive 10km-long park runs along the banks of the Manzanares River and offers a wide selection of sports and recreational facilities for the whole family. Seventeen play areas for children located throughout the park, with 65 different pieces of equipment. Imaginative equipment made of sustainable, natural materials, suitable for all ages. The most exciting ones are the slides hill, the tree trunk jungle and the super zip-line. 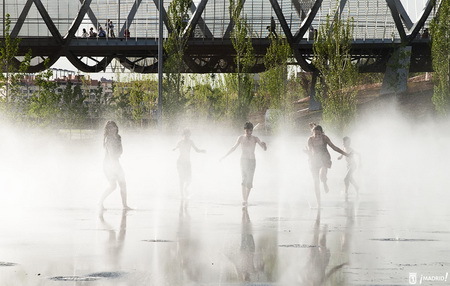 Then there is Madrid's Urban Beach, formed by three oval-shaped water areas with different effects: a smooth stretch of water, jets of varying heights and a cloud of water vapour. 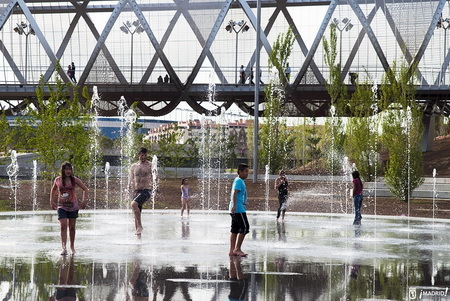 More than 5000 new trees have been planted in the Arganzuela park, which also possesses skating rinks, an auditorium for concerts, a new cultural centre and the already mentioned children's areas. In total, the green areas have more than 26000 trees. The project includes the restoration of the magnificent old bridges across the river, such as the Puente de Segovia, the Puente del Rey and the Puente de Toledo. 11 new footbridges have been built, allowing better access to both sides of the river, and a green corridor of pine trees will provide pleasantly shaded walks. Existing sidewalks have been widened and new parking facilities built.